FILE - President Donald Trump talks to the media before boarding Marine One on the South Lawn of the White House, Nov. 9, 2018, in Washington. Publicly at least, Mueller’s 18-month investigation was relatively quiet in the weeks leading up to the November 6 nation-wide congressional elections, partly because the Department of Justice tries to refrain from bringing politically sensitive cases forward around major elections. But legal analysts expect more developments soon. The U.S. leader contended on Twitter, without evidence, that "the inner workings of the Mueller investigation are a total mess." "They have found no collusion and have gone absolutely nuts," he said. "They are screaming and shouting at people, horribly threatening them to come up with the answers they want. They are a disgrace to our Nation and don’t care how many lives (they) ruin. These are Angry People, including the highly conflicted Bob Mueller, who worked for Obama for 8 years. They won’t even look at all of the bad acts and crimes on the other side. A TOTAL WITCH HUNT LIKE NO OTHER IN AMERICAN HISTORY!" 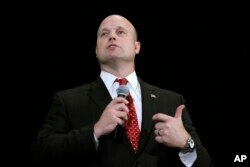 Whitaker, before joining the Justice Department more than a year ago, had disparaged the Mueller investigation and suggested that a replacement attorney general, such as he is now, could cut funding for the investigation so that it "grinds almost to a halt."